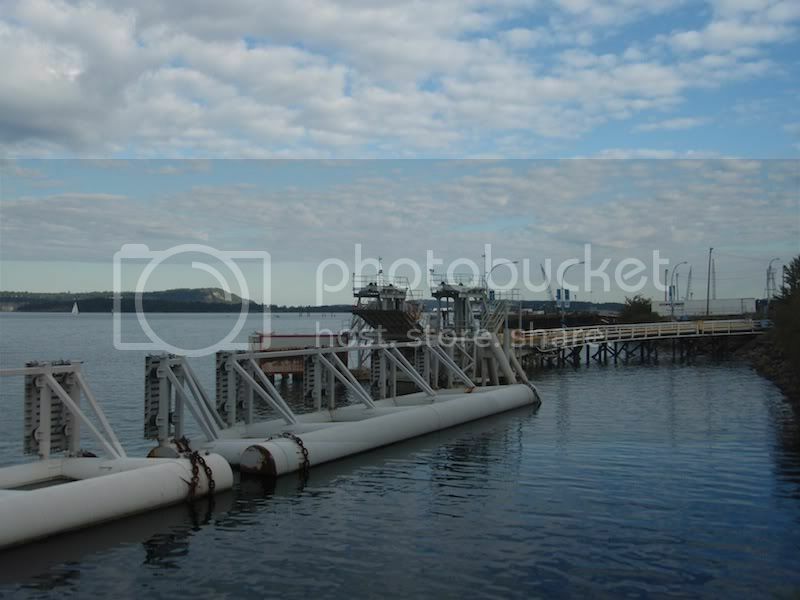 Photos of the Nanaimo harbour terminal, which is the gateway to Gabriola Island. Photos taken on March 21, 2010 from the harbourfront walkway, right next to the terminal, in the shadow of the condo tower. Quirky first view of the partially hidden berth. ... a few steps back, to add the Madrona/Arbutus tree to the shot. - the light marker is at Gallows Point, on the end of Protection Island. I was in Chemainus BC today, to see "Guys & Dolls" at the Chemainus Theatre. 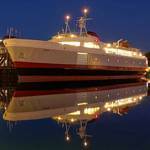 After the show, we went to see the Kuper arrive at the Chemainus terminal. Earlier in the day, while turning off the highway, we noticed that the sign for the ferry-terminal said "Thetis Island and Penelakut". Also at the terminal, we heard the terminal attendant refer to the Kuper Island destination as "Penelakut". Penelakut is the name of the 1st Nation that lives on Kuper Island. I wonder if this is a repatriation of the name for the island? Here is a view of the terminal from the end of the road, beside the traffic holding compound. The toll-booth and holding compound are further back (behind where I'm taking the photo from), because there needs to be public access to the marina which is right beside the ferry slip. - ferry slip is the road on the left, marina is the road on the right. View from the marina. Notice the red paint on the apron, instead of the old yellow. View up to the waiting room (located at top-left of photo), from the marina. Kuper arriving, churning some water with her forward-port Z-pod. If the history of Kuper Island on Wikipedia is accurate, it's amazing that the first nations people there tolerated their island being named for a British Navy captain as long as they did. Does this mean we can expect a renaming of the MV Kuper, as well? Perhaps something along the lines of the second (non-official) name that the MV Nicola carries would be a noteworthy reference to the identity of the island it sails to. This might be old news, but how come suddenly Kuper Island's been renamed Penelakut Island?? Does this mean that the little ferry Kuper's going to be renamed Penelakut, too? According to BC Ferries' site, the page was revised on August 24th, so the change is about a month old now. Take a glance at this here thread from say "mid-August", and you'll find a post by me about this very matter. Really it's there, just for someone like you to read. 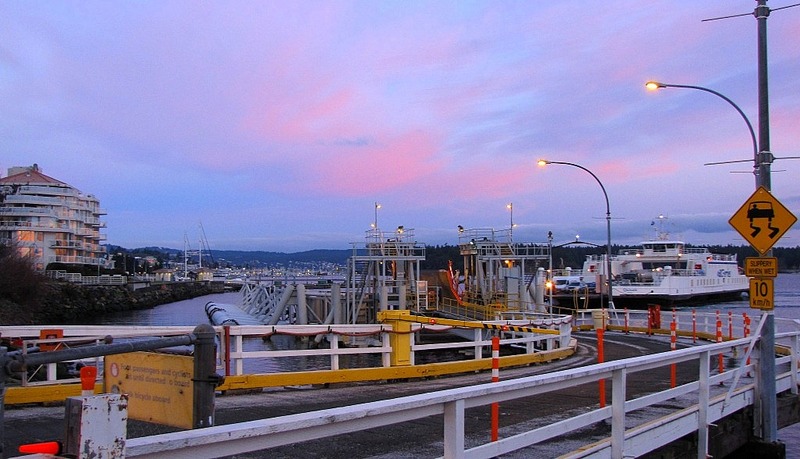 A photo-tour of the Chemainus ferry terminal. - photos taken by me on Sept.20, 2010. If you're doing a foot-passenger trip, you may need to figure out where to park your vehicle. Inside the terminal property is some 48-hour parking available, next to the crew spots. But there are only a few of these spots available. Street parking on nearby Croft St. (right around the corner from the terminal entrance) is good for a short trip, as it's 4-hour free parking. The street extends all along the side of the mill, up the hill towards the theatre, so if you don't find a spot near the terminal, just keep looking further up the street, and you'll likely find something with only a 5-minute walk back to the terminal. And here's the entrance to the terminal. - I asked about the new name for "the island formerly known as "Kuper". Apparently "Penelakut Island" is the new official geographic name, and new marine charts/maps are supposed to reflect this. - a lane-way towards the 1 ticket booth (drivers on the right, foot-passengers on the left-side of the booth). - and then a 3-lane holding compound. There is a passenger waiting room (with washrooms), similar to what's at the Westview terminal. There's a covered- walkway on the left-side of the jetty. There are some special requirements for being allowed in the foot-passenger area. Once at the gate, the sign reminds you that it's ok to smoke on any other ship; but not the Kuper. From the terminal jetty, there is no great view of the approaching ferry, because the harbour ships block the view. So it's a last-second "coming into view" experience when the MV Cue-Per rounds the last ship and suddenly comes into view at the berth. - the ferry-berth has the town marina on one side, and a shipyard on the other side. - here's a close-up of the ways. As I mentioned earlier, the berth is well hidden by the harbour neighbours. - approaching the berth, you can't see it. I realize that the camera-zoom distorts things, but the berth is at the gap that is just forward of the tug-boat's bow, and before the black dolphin. - as the ship approaches, the gap widens. 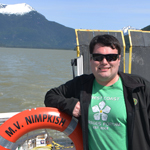 Penelakut Island is 100% 1st Nations reserve, and you need band-permission in order to disembark from the ferry at that island. - there are 2 smaller islands that the ferry-routes goes past or behind: Dayman and Hudson. 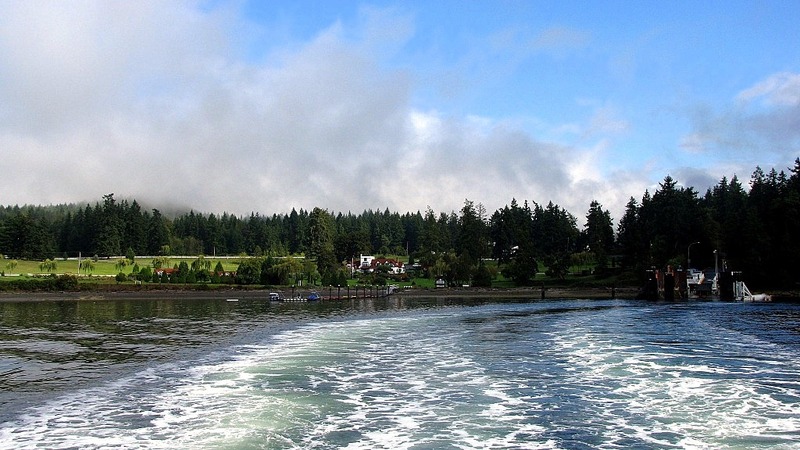 - For a direct route between Chemainus & Penelakut, the ferry goes south of Hudson Island. 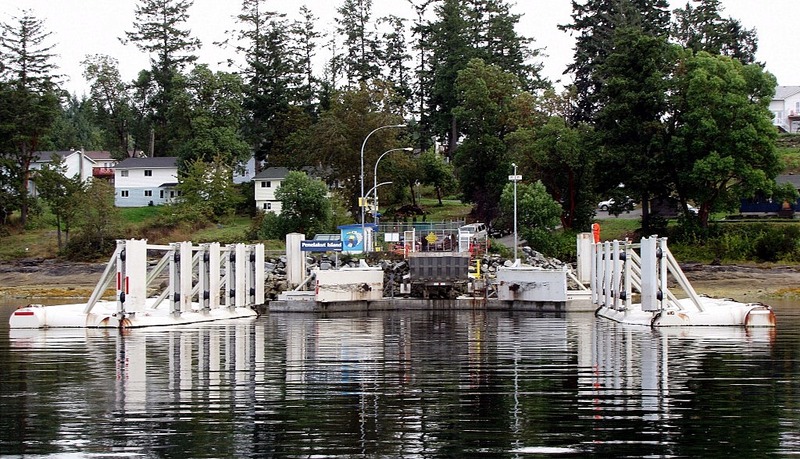 - For a direct route between Chemainus & Thetis, the ferry goes between Dayman and Hudson Islands. 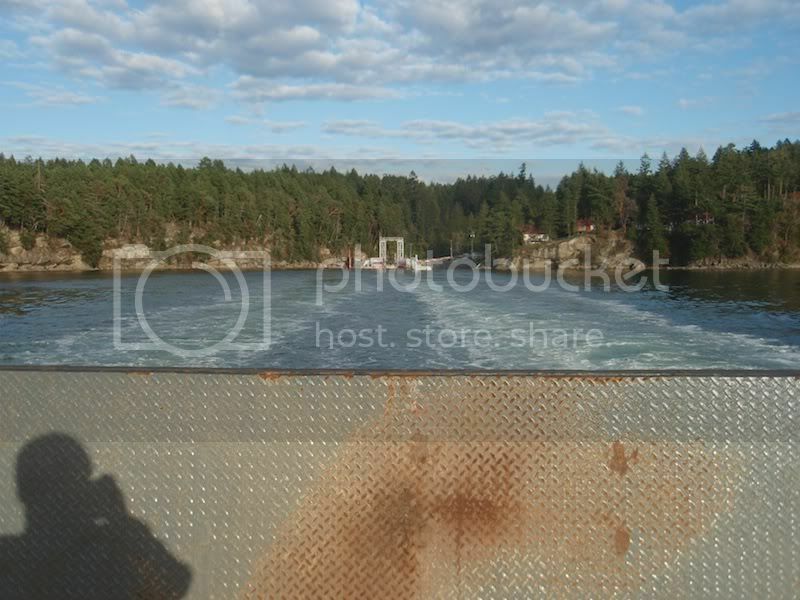 - And for the route between Penelakut and Thetis, the ferry goes behind Hudson Island, through a narrow channel between Hudson Island and Foster Point (which is on Thetis Island). Ferry in mid-journey, going to Penelakut. - Hudson Island is in foreground. 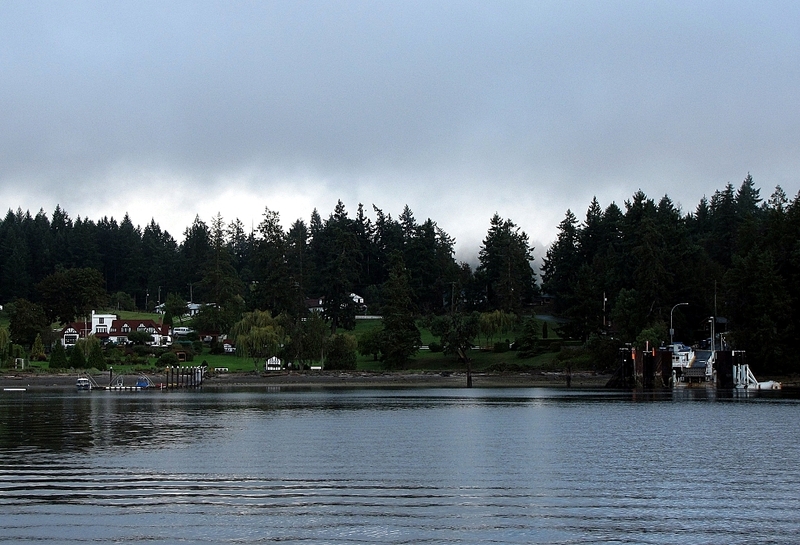 You can see the green fields of Capernwray Harbour (which is beside the Thetis landing) on Thetis Island on the left-side of the photo, and some houses of Penelakut are visible on the right side of the photo. Passing Hudson Island on our left, as we head into Penelakut. - the gap-in-the-trees on Hudson Island is a private air-strip. - you can see the green-fields of Capernway on Thetis, and Foster Point on Thetis is in the photo's centre. 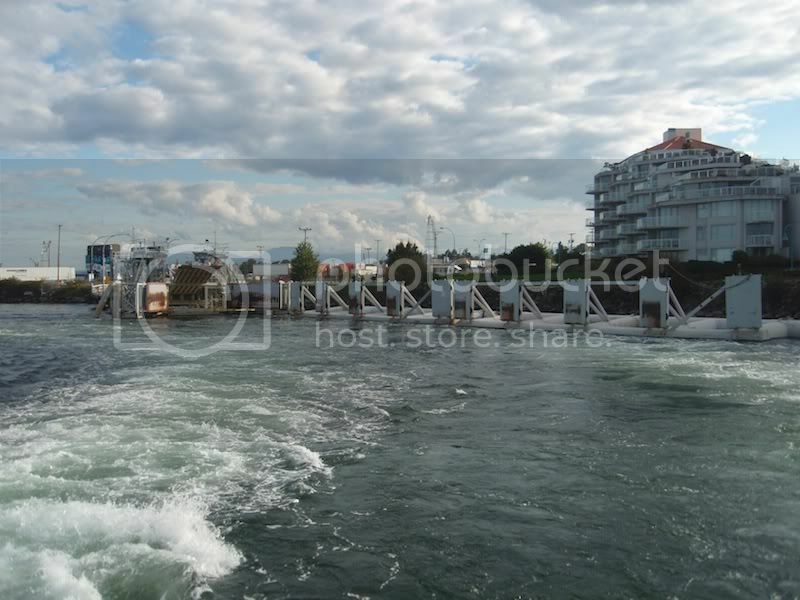 Approaching the berth at Penelakut Island. Next stop, Thetis Island ! The farm-like / resort-like fields and buildings on the left of the ferry-dock are the Capernwray Harbour Bible School & Conference Centre. - a group of ladies from my church attends a ladies-retreat that is held there, each year. - the holding compound is the typical "side of a steep, winding road". - Dayman Island on the right, Hudson Island on the left. Seeing that Thetus and Penelakut are so close together, why don't they just have a bridge built between the two islands instead of all the extra cost of running a ferry service to both? There is a little canal that seperates the two islands! At low tide you could almost walk right across. Little boats go through there when the tide is high! I have been to Thetis once and saw it but I havent been there recently! 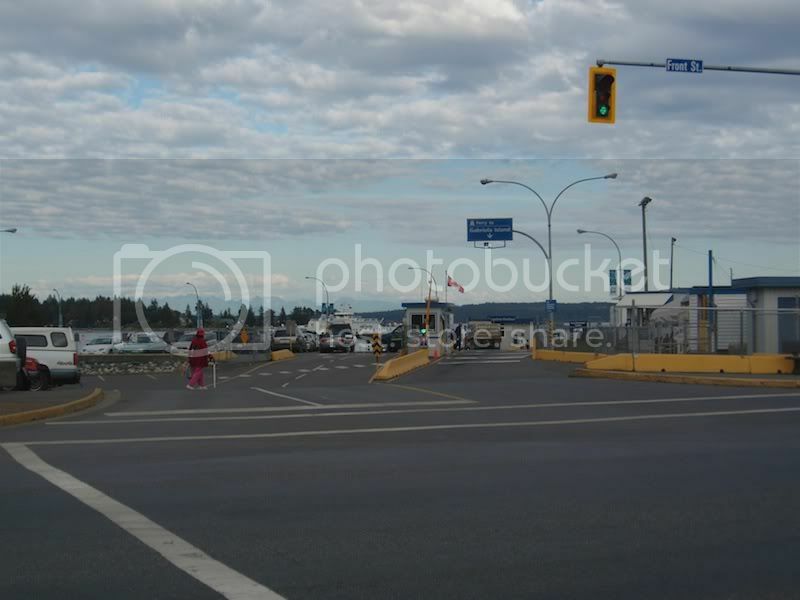 Photos of Nanaimo Harbour and Descanso Bay from September 22nd. - Kingfisher using the Nanaimo harbour terminal as a resting-spot. 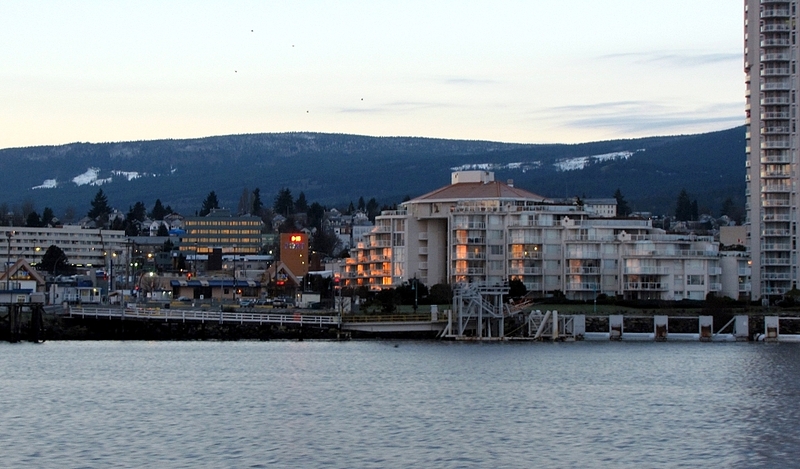 Another early morning view of the Gabriola route's Nanaimo harbour terminal. Upcoming work at Nanaimo harbour terminal (Gabriola route). 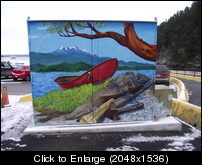 British Columbia Ferry Services Inc. invites tenders for the construction of a new waiting room / washroom building located at the BCF Nanaimo Harbour Terminal in Nanaimo (Project Number 90731). 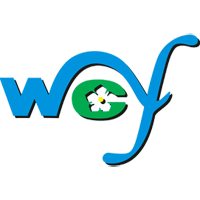 In general the work will consist of the demolition and removal of the existing waiting room / washroom building and the construction of a new single storey facility of approximately 950 sq.ft. in size. The building will sit on concrete foundations with concrete slab on grade; concrete masonry and wood frame construction for the walls and wood framing for the roof structure, exterior Hardie Panel and metal cladding and 2 ply membrane roofing system; storefront type aluminum windows and doors. Nanaimo harbour terminal's new building, under construction. 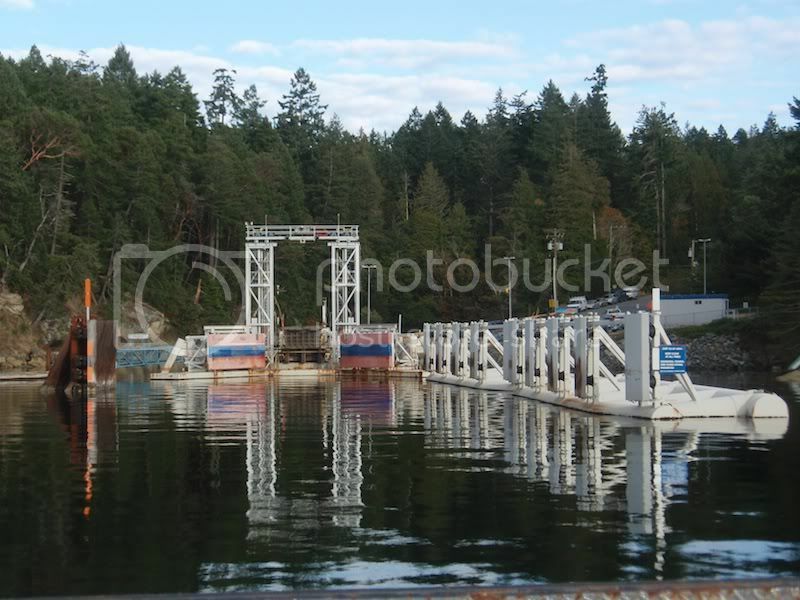 - this will be used for the passengers waiting to travel to Gabriola Island. - photo from June 4, 2011. Photo of the construction of the ferry-landing at Descanso Bay. A new thread to break-out Gabriola and Thetis/Penelakut route terminals. - to reduce congestion on the main Southern Gulf Islands terminal thread. Karl has given me permission to post some photos from his Facebook albums. 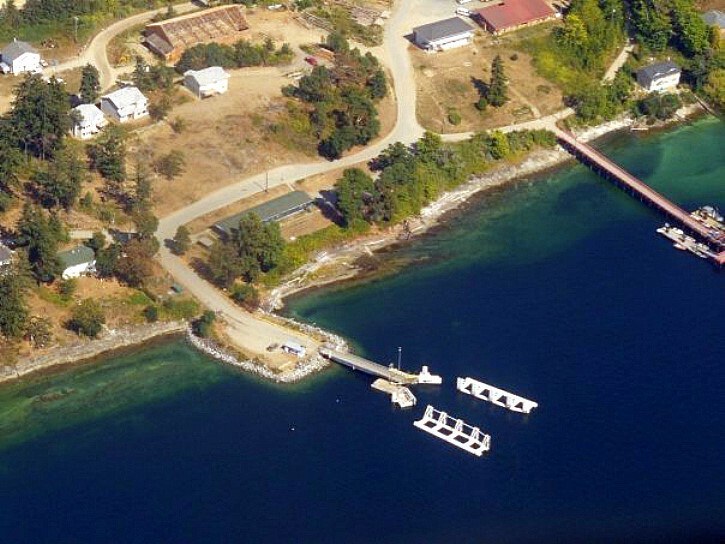 An aerial of Nanaimo Harbour Ferry Terminal, visible in the center of the image, circa 1992. August 20, 2011 photos of the under-repair trestle at Nanaimo Harbour terminal. - 1 week after a paving contractor damaged the structure. The new passenger building at Nanaimo Harbour terminal, for the Gabriola Island route. That's Seaspan's Carrier Princess in the background.